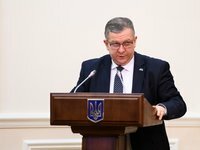 Social Policy Minister of Ukraine Andriy Reva has said that military servicemen's pensions will be recomputed from January 1, 2018, even if the law is passed later, the press service of the Social Policy Ministry has reported. "Regardless of when the Verkhovna Rada adopts this bill, the recalculation of pensions will begin from January 1, 2018. The bill itself prescribes a rule that sets the recalculation precisely from this date," the press service said, quoting Reva as saying. According to him, as a result of the update, pensions will be increased for each individual, depending on the length of service and the amount of cash support, but the average increase will be UAH 1,500.